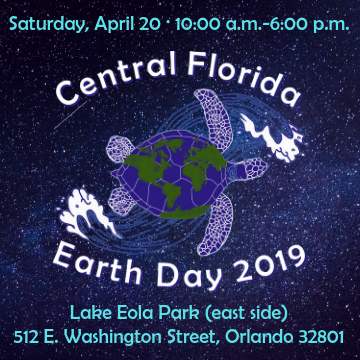 Thank you for helping to promote Central Florida Earth Day 2019! 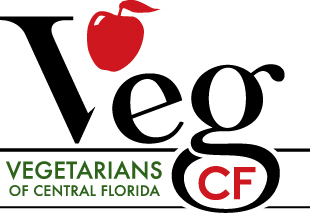 You may use any information or images from this website or Facebook pages to promote the event. Please RSVP on the Facebook event page. Participants in the event are welcome to promote your participation there. And invite people you know to RSVP. Please join the Facebook community Page. We will promote sponsors, nonprofits, activities, etc. on that page. 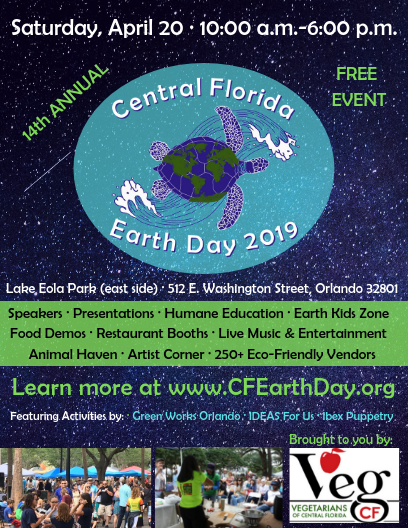 If you would like Earth Day posters and flyers, please contact Saffy Carson at Saffy@CFEarthDay.org or 818-238-7866. Or you can download posters (11" x 17") and flyers (4.25" x 5.5") below (right click on the image to copy or save). ​You are welcome to use it on your personal or professional page. Please save the image to your computer and upload it to Facebook (click skip cropping, so that the full image appears on your Facebook profile). Save the image to your computer and upload to Facebook. Please post it on your website, Facebook page, emails, etc. Please link the image to this website: www.CFEarthDay.org. ​Please post it on your website, Facebook page, emails, etc. (right click on the image to copy or save). Please link the image to this website: www.CFEarthDay.org.